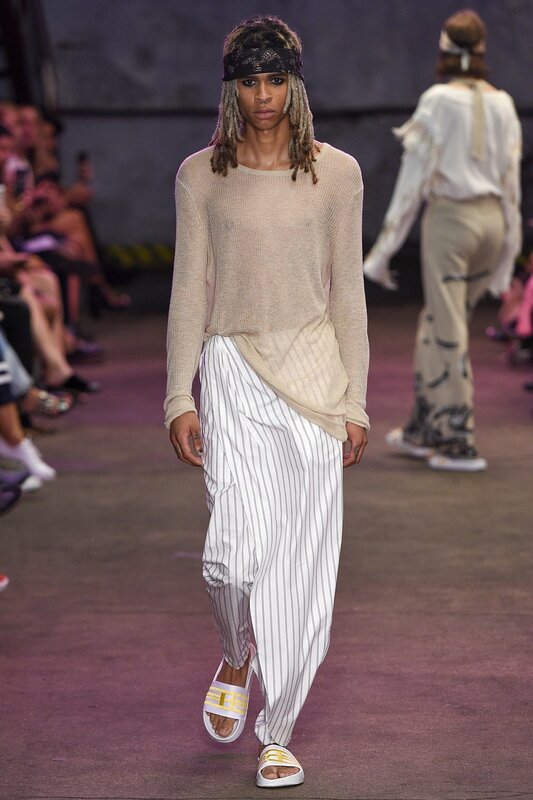 Tucked away in a steamy parking garage in Tribeca on one of New York City's hottest September nights, a crowd sits and waits for beautiful boys and girls to stalk the runway showcasing the latest collection from Baja East (@bajaeast). Amidst the moody pink and turquoise lighting, reminiscent of a Francis Lawrence music video, slightly dewed fashionistas, artists and editors fanned themselves while waiting for the show to begin. When the first look hit the runway it was lust at first sight. Opener Irina Kravchenko cruised the runway in a plunging, lightly frayed, pin stripe jacket tucked into fringe trimmed trousers. The look was slightly oversized and loosened, yet rich in sensuality. Each looked that followed was a brilliantly maxed out evolution of the Baja aesthetic. Pin stripes, reduced jackets and oversized trousers lent a relaxed formality to the collection while bold prints, luxe fabrications and casual footwear stayed true to the brands original philosophies. The models styled with dampened hair and an array of tie-dyed headbands looked as if they came straight from a late night bonfire on the beach. It was a bountiful collection produced by designers John Targon and Scott Studenberg and easily one of my favorites from NYFW. Photos by Umberto Fratini for Vogue.